Updike Home Delivery Services is the premiere residential delivery provider of products destined for the home. 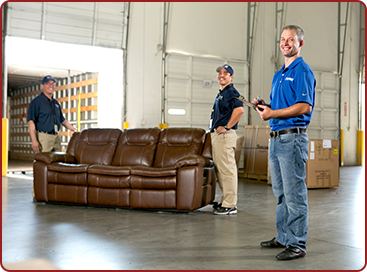 By combining our unparalleled network of UDL warehousing facilities, long and short haul power units, and delivery assets with our extensive network of furniture specialty transportation providers and final mile delivery agents, Vast is able to offer a complete solution for nationwide residential and final mile delivery. We have been providing the utmost care and custody of merchandise for a decade, and maintain the highest standards for handling and transporting furniture, mattresses, medical supplies, exercise equipment, appliances, and items that require specialized handling and delivery. Our capabilities include all facets of the logistics process, including both asset-based and non asset-based solutions. We utilize top-tier inventory tracking systems throughout the entire process to give our customers piece of mind and the visibility needed to empower everyone involved with the order process and sale. Whether you are looking for warehousing and distribution, coast to coast furniture delivery, final-mile capability, White Glove or Threshold home delivery, business to business delivery, regionally focused delivery, or a combination of all of these, we can custom tailor a solution to meet and exceed your expectations. All of this is done with one point of contact, and under one consolidated invoice to simplify things as much as possible. That is the Updike difference. We understand that getting the product to your customer quickly is of the utmost importance. We use a multifaceted approach using assets and non-assets to provide the best solution possible while not sacrificing the integrity of the merchandise. We can help formulate a solution to ideally meet your unique requirements, including a multi-regional concept to assist in reducing transit times. We have the capabilities to pickup from multiple regional distribution centers in order to provide shorter transit lengths and times, while streamlining the delivery process. Delivering value by taking premium care of your merchandise throughout the supply chain is one of our core principals. We are experts at providing a solutions-based approach to reducing damages. We consistently maintain some of the lowest damage rates in the industry through minimal consolidation and less handling than our competitors. Product is touched as few times as possible during the life cycle of the order, and we always handle, load, and unload product by hand throughout the supply chain. Reverse logistics is one of the most difficult aspects of eCommerce. Our capabilities allow us to simplify the process through creative solutions at the local level. Our systems allow seamless visibility to excess inventory in the field, and we offer several excellent choices for merchandise that is used or otherwise out of the OEM packaging. Our White Glove delivery includes inspecting product at the final mile delivery agent, and providing minor touch ups as part of our deluxing process. If product is found to have extensive issues, we can facilitate a repair by an expert furniture medic. We offer delivery services for retailers looking to provide home delivery as a competitive advantage. We have the capacity to provide dedicated assets to retailers, including using their logo on our equipment as part of our dedicated services. Give us a call for more information. Our premier delivery service includes a two person team carefully placing the merchandise into the room of choice. This service includes full inspection at the final mile delivery agent location, minor touch up of merchandise if needed, full set up inside the home or business, and removal of any packaging from the premises. We will not set the delivery appointment with the consumer until the product is verified to be in pristine condition. 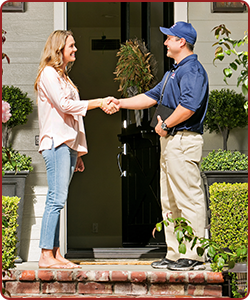 Our basic service includes a two person delivery team placing the merchandise inside the front door of the home or facility. For more information regarding our services, please email or call. We look forward to proving our value and changing the way you think about home delivery. Updike Distribution Logistics and Vast Delivery Solutions partner together to be the premiere residential delivery and white glove delivery service in the industry. White glove delivery service means we go the extra mile in our service!